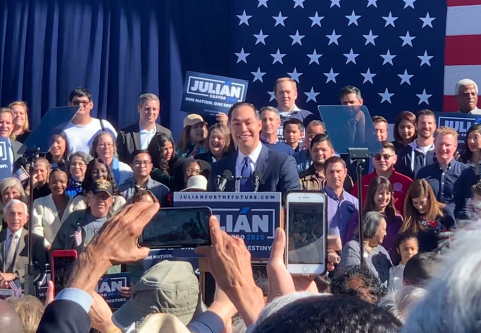 SAN ANTONIO—Former Secretary of Housing and Urban Development Julian Castro ended months of political speculation on Saturday when he announced his candidacy for the 2020 Democratic presidential nomination. Castro, flanked by friends and family, told a crowd assembled at San Antonio’s Plaza Guadalupe he was ready to embark on the next chapter of his "American dream." "I’m running for president because it’s time for new leadership," Castro said. "It’s time for new energy and it’s time for a new commitment to make sure that the opportunities I’ve had are available for every American." "In the years to come, we must go forward as one nation, working toward one destiny. And that destiny is to be the smartest, the healthiest, the fairest, and the most prosperous nation on earth." "Demanding anything less is a failure of vision. Achieving anything less is a failure of leadership." Castro, who served as mayor of San Antonio from 2009 to 2014, has long been touted as a national candidate. Such speculation first began in 2012 when then-President Barack Obama tapped him to deliver the keynote address to that year's Democratic National Convention. The rumors only intensified when Obama nominated Castro to lead HUD in 2014. Although passed over for the vice-presidential slot on Hillary Clinton's failed 2016 campaign, Castro was a prime surrogate for the ticket. After leaving the Obama administration, Castro formed a political action committee and traveled the country campaigning for Democratic candidates on the 2018 midterm ballot. In December he officially launched a presidential exploratory committee. In his remarks, portions of which were delivered in both English and Spanish, Castro said he was compelled to run out of a desire to preserve the "opportunities" that made families like his flourish. "My family’s story wouldn’t be possible without a country that challenged itself to live up to the promise of America. That was the point of the American Dream: It wasn’t supposed to be just a dream. America was the place where dreams could become reality. But right now, the reality isn’t working." Castro said his life experiences and public service proved he was capable of addressing the plight of everyday citizens. "Here in San Antonio, I made [pre-kindergarten] happen. As president, we’ll make … universal pre-kindergarten for all children whose parents want it, so that all of our nation’s students can get a strong start. And we won’t stop there." To that end, Castro also endorsed a number of progressives policies—Medicare for All, criminal justice reform, and an increased minimum wage, among others—to prevent America from "falling backward instead of moving forward." His most substantial promise, however, was reserved for the topic of climate change. "As president, my first executive order will recommit the United States to the Paris Climate Accord. We're gonna say no to subsidizing big oil and say yes to passing a Green New Deal." Castro's entry into the race makes him the third Democrat to declare in what is expected to be a packed field. Currently, no less than 25 Democrats have expressed interest in running. On Saturday, the former secretary appeared unfazed by the potential competition. Speaking to the crowd on San Antonio's predominantly Hispanic and working class West-Side, Castro urged political observers to not count him out. "Look around this neighborhood, there are no frontrunners born here, but I've always believed that with big dreams and hard work, anything is possible." Unlike other Democratic presidential hopefuls, Castro signaled he wouldn’t shrink from taking on President Donald Trump. "Just a couple days ago, President Trump visited McAllen, Texas—just south of here—after claiming that we’re facing an ‘invasion’ at our border." The crowd hurled ‘boos" at the mention of Trump. "He called it a national security crisis. Well, there is a crisis today–it’s a crisis of leadership. Donald Trump has failed to uphold the values of our great nation … and the cruel policies of this administration are doing real and lasting harm." It appears unclear if such attacks will be enough to distinguish the secretary from better known and better-funded candidates vying for the nomination. Several of the attendees at Plaza Guadalupe told the Washington Free Beacon they were excited about Castro's candidacy. "Our [former] mayor is running president. A son of San Antonio being the first Latino president is a big deal," said Pete Gonzalez, an electrical worker brimming with pride for his hometown. "It's probably an even bigger deal given everything that's happening with immigration right now." Patricia Reyes, who admitted to being a relatively new addition to San Antonio, had a more objective view on Castro's candidacy. "I think he hit right notes for me in that speech. When he talked about expanding opportunities and making sure we have a country that is fairer and healthier … it really affected me," Reyes said. "I'm consistently worried my children won't have a better life than the one I've been privileged to lead." Despite Castro's rhetoric, Reyes admitted she was concerned about his level of experience. "He's obviously a talented and intelligent person. Being in the cabinet and mayor is great, but we elected someone with no record of governing last time and look where we are now." Neither Gonzalez nor Reyes were sure what impact former congressman Beto O'Rourke, a fellow Texan, would have on Castro's chances were he to run. This entry was posted in Politics and tagged 2020 Election, Democratic Party, Julian Castro. Bookmark the permalink.